Back in June the BBC News website reported that Israel had ‘blamed’ Iran for supporting the ‘Great Return March’ violent rioting along the Gaza Strip-Israel border which was then in its third month. In the leaflets dropped on Gaza Israel’s military repeated its warning to Palestinians to not go near the heavily-fortified border fence. As was noted here at the time BBC audiences were not provided with any substantial background concerning Iran’s backing of terror groups in the Gaza Strip in order to enhance their understanding of the Israeli statement. A conference was held in Tehran in late November. In contrast to many other media outlets the BBC did not report on those offensive remarks from the Iranian president whom it has repeatedly promoted as a ‘moderate’, or on the widespread condemnation they received. The Times of Israel reported Hamas’ reaction to that statement. “The Gaza-ruling Hamas on Tuesday thanked Iran for its financial “adoption” of the families of Palestinians killed and wounded during clashes it has been encouraging along the border with Israeli troops. Hamas spokesman Fawzi Barhoum said his group “values” and “highly appreciates” Iran’s support, the Saudi-owned Al Arabiya broadcaster reported. Unsurprisingly, the BBC’s obligation to provide “accurate and impartial news, current affairs and factual programming of the highest editorial standards so that all audiences can engage fully with issues” has not ensured that its funding public has received this highly relevant background to the events it has been describing as “protests” for over eight months. “His campaign slogan “moderation and wisdom” continued to be a theme at his inauguration in August. Whilst the BBC has never actually got down to discussing the nitty-gritty of Rouhani’s interpretation of ‘moderation’ and ‘reform’, two recent reports indicate that his agenda does not include human rights. The United Nations Special Rapporteur on the situation of human rights in the Islamic Republic of Iran, Ahmed Shaheed, published a report last week which includes examination of the ‘right to life’. Mr Shaheed found that the number of executions in Iran has risen under Rouhani’s presidency. He also found that minors were executed. Another topic addressed in the report is freedom of expression. Persecution of Bahais and Christians is noted in the report and – in contrast to the BBC’s recent whitewashing of the issue – it also presents a grim picture of women’s rights in Iran. A report on the death penalty in Iran was also issued last week by ‘Iran Human Rights’. That report notes a 10% increase in executions in 2014 compared to the previous year. 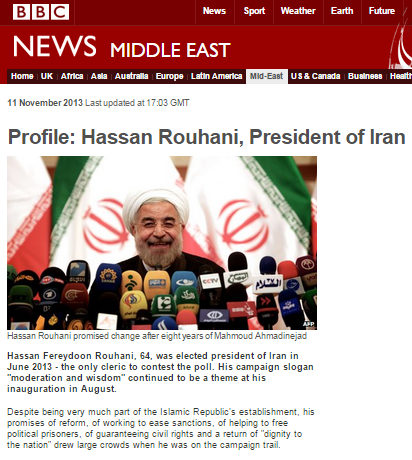 It is clearly time for the BBC to explain to audiences why it continues to describe the current Iranian president as ‘moderate’. 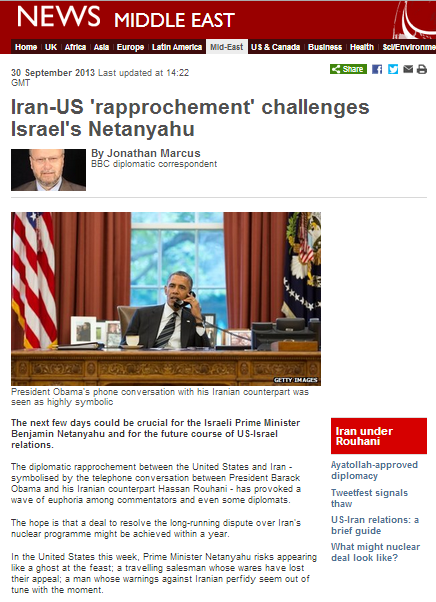 Although it did not stay up for long, visitors to the BBC News website’s Middle East page on September 30th 2013 were offered the opportunity to read BBC diplomatic/defence correspondent Jonathan Marcus’ supercilious chiding of the Israeli government for not being in step with the latest fashion under the title “Iran-US ‘rapprochement’ challenges Israel’s Netanyahu” – presented under the heading “Features & Analysis”. Although Marcus admits that the spectacle of smiles, soft phrasing and one phone call “has provoked a wave of euphoria among commentators and even some diplomats”, he does not offer any serious analysis on the subject of whether that “wave of euphoria” – also being ridden by the BBC – has any justification. Revealingly, Marcus presents Israel as the lone party pooper out in the cold and in order to do that, he has to funnel the entire ‘Iranian issue’ into the packaging of a deal curbing Iran’s nuclear ambitions, whilst ignoring other no less relevant issues such as Iran’s support for Bashar Assad’s regime and its involvement in international terrorism. Significantly, he ignores the fact that even the media’s current favourite ‘Mr Nice Guy’ has clearly stated that he would “never give up his country’s right to enrich uranium“. Of course Israel is not the only country in the Middle East to be underwhelmed by the sight of Western politicians and journalists swooning over Hassan Rouhani like teenagers at a Justin Bieber concert – although BBC audiences are told nothing about that. The Bahraini foreign minister’s recent UN speech revealed some of that country’s concerns. Likewise, the press in other Gulf States – along with additional commentators – reflects concerns in other countries which are no less threatened by Iran’s nuclear ambitions than Israel. Marcus – in line with many of his colleagues in the media – appears to have persuaded himself that a few recent strategically chosen words and phrases, uttered by less than a handful of dignitaries, signify a “moderating” of Iranian Holocaust denial for which Israelis should be grateful – and he now seeks to herd his readers towards the same conclusion. Marcus’ interpretation of comments made by Hassan Rouhani and his foreign minister is of course based on what might be politely called selective hearing. 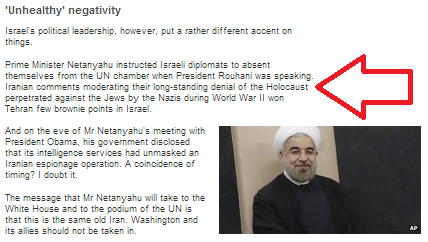 Ten days before the appearance of Marcus’ article the BBC News website published an item on Rouhani’s NBC interview in which it completely ignored the parts of the conversation relating to the Holocaust. Rouhani’s “I’m not a historian” line appeared again in a later controversial interview with CNN which received partial coverage from the BBC with no mention of Rouhani’s subsequent remarks which revealed little in the way of “moderation”, at best clearly questioning the scale of the Holocaust. “Therefore, what the Nazis did is condemnable. The dimensions of it which you say, is the responsibility of historians and researchers to make those dimensions clear. I am not a historian myself. On September 8th the BBC claimed that Iranian foreign minister Mohammad Javad Zarif had “distanced himself from the Holocaust denials of former President Mahmoud Ahmadinejad” in a Tweet in which Zarif in fact related to Ahmadinejad’s “perceived” Holocaust denial. Since then, Zarif has publicly said that “the Holocaust is not a myth” whilst at the same time blaming “bad translation” for the fact that a statement on the official website of Iran’s Supreme Leader describes the Holocaust in exactly such terms (and regime-controlled media continues down the same route) and using antisemitic Nazi analogies. For some reason, Jonathan Marcus seeks to persuade BBC audiences that Israel should be gratefully giving out “brownie points” to any Iranian official who does a mealy-mouthed makeover on Ahmadinejad’s previous performance. The waters of that “wave of euphoria” appear to have turned Mr Marcus’ critical and analytic faculties rather soggy.